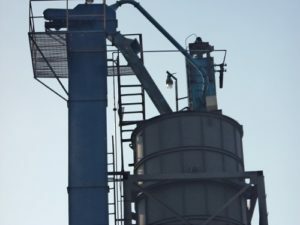 Bucket Elevator is in use and has proven to be effective and efficient for vertical transport of wide range of bulk materials for decades. It is available in a wide range of capacities and may operate entirely in the open or be totally enclosed. Typical bucket elevator consists of a series of buckets mounted on either a chain or a belt operating over a sprocket or pulley. In order to compensate for any changes in length of belt or chain due to temperature change or wear and tear, take ups are provided. Other critical parts includes head section (which contains head pulley or sprocket) and boot section (which includes tail pulley or sprocket), intermediate sections. Material is fed into an inlet hopper. Buckets through scooping action dig into the Material, and convey it up to and over the head sprocket/pulley, then throwing the material out the discharge throat. The emptied buckets then continue back down to the boot to continue the cycle. AEGIS has an experience of 30 years in manufacturing Bucket Elevators. AEGIS manufactures both chain type and belt type bucket elevators. The discharge can be centrifugal type or continuous discharge. The selection of right type of bucket elevator is critical and it depends on various factors. Bucket Elevators manufactured by AEGIS are of high quality, precisely fabricated. The inputs used are of repute make. AEGIS make Bucket Elevators are characterized by sturdy design and ease of operation and maintenance. Two piece hood permitting access to head section interior without any interruption to machinery.